Start your trip off by heading to Ocean Drive, which is a well-known tourist spot. Here you can admire the famous art deco architecture. There are guided tours available where you learn about the history of the buildings. 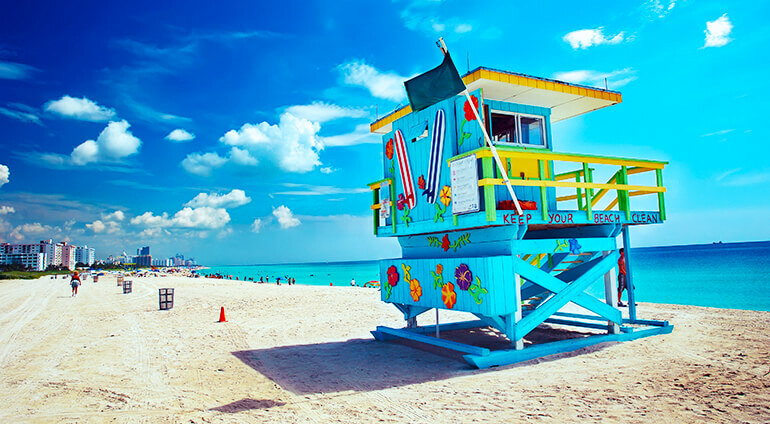 Another must visit spot is Miami Beach, which regularly claims a spot in the top beaches in the world. There are plenty of beautiful beaches to choose from along the Miami coastline. If you are on a family holiday there are quieter beaches to visit, there are also surfing beaches and some great beach party sports to visit. If you want to get away from the busier parts of the city, there are plenty of public gardens to enjoy. There’s Fairchild Tropical Botanic Garden and Bayfront Park, which is a 32-acre urban park located in Downtown Miami. Animal lovers won’t want to miss Jungle Island, an interactive zoo with a huge range of animals including primates, birds, wild cats, reptiles and fish. Or there is also Miami Zoo, which is the largest and oldest zoo in Florida. Take the kids here to see lions, bears, tigers and gorillas. For a real taste of Cuba, head to Little Havana, a bustling area with lots of shops, restaurants and cafes where you can try a Cuban cigar.